Joanne Dallaire is descended from a matrilineal line of medicine people. Her great-grandmother, grandmother and aunt, all identified as Indigenous medicine women in the early 1900s. Around this time, discrimination against all aspects of Indigenous heritage and culture had become so widespread that it forced many to take their traditions underground, away from the eye of the government, a drastic veer from an attitude that once encouraged sharing knowledge within the Indigenous communities as well as with non-Indigenous people. Although it is Indigenous tradition to pass down family knowledge to the next generations, according to Dallaire, “no one else wanted to be involved with it. No one was going to take on the job of helping people who were gonna call you names and throw things at you when they saw you in their town,” she explained. There were some, she said, who had continued to practice traditional ways of being and ceremonies, but it was hidden and kept secret. Dallaire’s story isn’t not an unusual one. 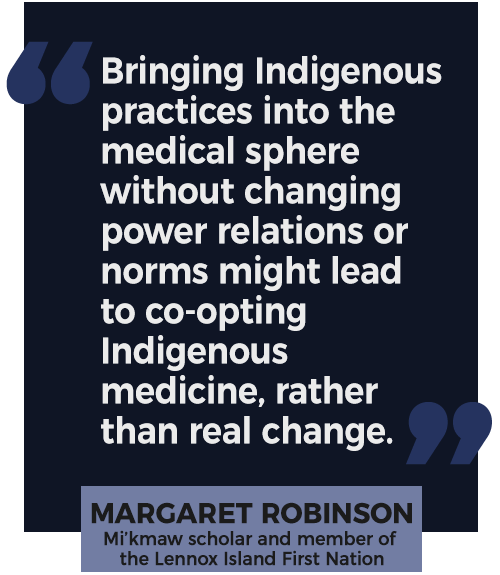 It illustrates simply one of the many reasons which have collectively resulted in a still tenuous relationship between Indigenous medicine and the western medical system. Although steps have been taken in the past two decades to forge a more harmonious relationship, the decades of colonization, exploitation and racial prejudice have resulted in a sense of vigilance around the knowledge that remains and a deep mistrust in sharing it. She did add though that there has been action taken to provide Indigenous patients with the option to access someone, i.e, a healer, a medicine person, in their communities. “For example, Cancer Care Ontario, where I used to work, has an Aboriginal cancer unit, where there are Indigenous people working to help support Indigenous people with cancer, “ Maracle said. Indigenous patient navigators have also been employed to help connect Indigenous peoples with others in their community. 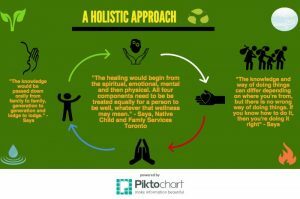 However, there is still a long way to go before traditional healing can be fully acknowledged by the mainstream healthcare system. In 2000, Algonquin Elder Annie Smith-St. Georges founded WÀGÉ (pronounced w-ah-gay), a health centre that integrated Indigenous, alternative and western medicines on a model based on the medicine wheel. “If I didn’t have all of the alternative and the medical (care), I wouldn’t be here today,” she said. The loss of her son, her mothers and other circumstances in a short period of time had, said Smith-St. Georges, left her so overcome by Post-Traumatic Stress Disorder (PTSD), that she couldn’t function normally. Smith-St. Georges based WÀGÉ on the model of the medicinal wheel. This meant that not only were a variety of medicinal practices offered at the centre, but also each practice was interconnected through wholesome relationships between the practitioners, including herself as the medicine person. Although it initially drew skepticism from the community, WÀGÉ gradually flourished, also attracting to non-Indigenous clients, who would stay at the centre for the whole day until closing time, Smith-St. Georges recalled. As the staff grew older, WÀGÉ was soon shut down, but it left a promise of what the future could hold for a relationship between Indigenous and western medicine. That’s not to say that Smith-St. Georges isn’t aware of the current skepticism held within the mainstream medical system of Indigenous medical practices. She agrees, along with the others, that for there to be any relationship, there needs to be a recognition of Indigenous issues and rights by health authorities.